Alicante, Spain, is the best place in the world. It says so right there — carved in the marble plaza in front of City Hall. We would’ve missed it if Maria had not pointed it out and explained: that’s the city’s official motto. Maria was our guide on the Free Walking Tour of Alicante. In less than three hours, we saw the sights and got a history lesson. It’s “free” because you don’t pay up front, you pay at the end — whatever you think the tour was worth. It’s a great concept that’s also available in other Spanish cities, such as Valencia, Barcelona, and Madrid. 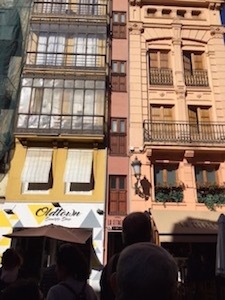 The narrowest house in Europe — just one meter wide — is a quirky stop on the Free Walking Tour of Valencia. You sign up online for these tours, usually through sites such as Trip Advisor. There’s a designated meeting place and your guide holds up a colored umbrella, making them easy to find. In Alicante, we learned the city hasn’t always been such a great place. People here endured death and destruction in two wars. While nobody remembers the early 18th century War of Spanish Succession (Alicante was on the losing side), memory of the 1930s Spanish Civil War and its aftermath is more clear, especially for the older crowd. Alicante was on the losing side in that one, too. In fact, our tour ended on the plaza behind Central Mercado, where we considered a plaque memorializing the 300 people killed May 25, 1938, in a bombing by Italian planes. Since the mid-20th century — and especially since the 1980s — things have gotten progressively better. Our guide explained that Scandinavian tourists discovered Alicante’s terrific beaches, but were put off by the Spanish government’s ban on women wearing bikinis. A delegation of city leaders sought relief in Madrid. When they explained how much money these foreigners would bring into Spain, the bikini ban went bust and the tourism boom began. More tourists meant more jobs in this Costa Blanca town, helping the population grow to more than 300,000. Today, this is a thriving city that feels good about itself — hence, the motto. That’s the kind of interesting, quirky stuff you learn walking around town with a local, especially when they are knowledgeable and entertaining. Our guides even helped us find great non-touristy spots for lunch. We were generous when it came time to pay. We hope others were, too. We don’t know if Alicante really is the best place in the world. But we think Maria is one of the best tour guides in Spain, and the free walking tour concept is a winner. 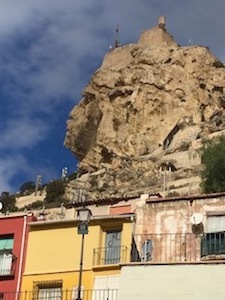 See the profile of a man’s face on the left side of Benacantil Mountain? If so, then you can live in Alicante. Just one of many fun facts from the Free Walking Tour of Alicante.